Bryan Hickey and Richarda Abrams in Homeless and How We Got That Way. Photo by Jay Rivera. BOTTOM LINE: A detailed and believable depiction of what it means to be homeless. One of the most unpleasant parts of being a New Yorker is the helplessness one feels when encountering the homeless. It’s impossible to live in this city without being asked for money or something to eat. It’s not uncommon to encounter a resident of the New York City streets yelling violently at someone who simply isn’t there. Who are these people? What are their stories? 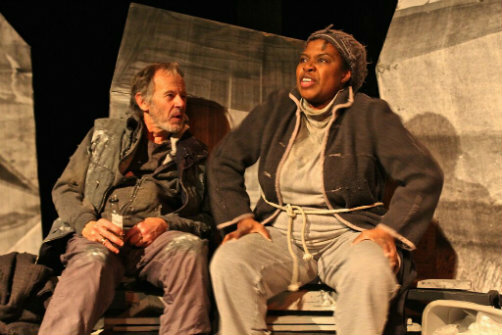 Dan McCormick’s new play, Homeless and How We Got That Way, sheds insight on these questions in a very convincing way. The play paints a clear picture of the lives of two unfortunate souls, Sidney (Brian Hickey) and Eloise (Richarda Abrams), both raging alcoholics who have nothing to live for but the soothing intoxication that comes from a swig of whiskey. Both characters are profoundly accomplished—he used to be a leading neuro-surgeon at Johns Hopkins, and she is a past winner of the National Book Award—but both have also suffered unspeakable tragedy and trauma. Sidney’s drinking caused him to neglect his family in their greatest hour of need leading to the death of his beloved wife. Eloise, meanwhile, is a survivor of sexual abuse at the hand of her father. Both use whiskey as a way of running away from their tragedies and demons. McCormick sketches complete and complex pictures of his characters, and he is lucky to have the excellent Hickey and Abrams to bring them to life. The acting is not just convincing, it’s relentlessly gripping and heart wrenching. Hickey and Adams share a cordial conversation frequently interrupted by their volatile hallucinations and violent flashbacks of their tragic past. The first time this happened, I wondered if they struggled with mental illness or if the interruption was a theatrical convention transcending time and space. The confusion was created by a beautiful shift in lights, designed by Travis Sawyer. But after enough interruptions that only intensified as the play went on, I could only conclude that these characters were indeed mentally ill. Sawyer might have avoided this confusion with a less interesting design, but try giving that note to a talented artist. James Phillip Gates’ directing is successful in keeping these characters engaged with one another so that we can learn a tremendous amount about them in a short amount of time. Kevin Kedroe’s clever set design uses random junk, like empty buckets, scraps of wood, and discarded furniture, to form an imaginative habitat for the homeless characters. The backdrop for the action is an arrangement of two-dimensional cut-outs, painted in a gray scale, that look like abandoned shanties that evoke a row of tombstones; the implication is clear. Raven Roberts’ exceptional costume design, using rags and tatters, lends realistic credibility to the characters. The success of the acting, directing and design elements notwithstanding, this play may still struggle to maintain your attention. While McCormack’s characters are wonderfully detailed with specific and well fleshed out histories, it’s not entirely clear why they need to exist in this play together. Their relationship is underdeveloped and underutilized. They never rely on one another to achieve their objectives, but merely give each other an excuse to vocalize their back-stories. The piece would have been just as successful as two short monologue plays in which the characters address the audience directly. While the dialogue is snappy and pleasant to listen to, the writing lacks action and the characters lack objectives. One wonders why the day in which the play takes place is any different than the day before. This ambitious piece will contribute to your understanding of what it means to be homeless, but would benefit greatly from a little more development. Homeless and How We Got That Way is written by Dan McCormick and directed by James Phillip Gates. It is produced by Roust Theatre Company. Set design is by Kevin Kedroe. Costume design is by Raven Roberts. Lighting design is by Travis Sawyer.